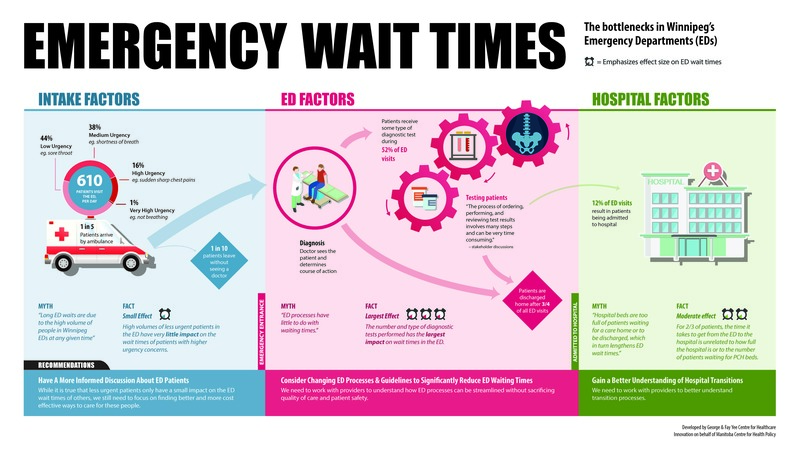 Manitoba Centre for Health Policy recently launched its report Factors Affecting Emergency Department Waiting Room Times in Winnipeg. The launch featured an infographic developed with CHI Knowledge Translation. CHI Knowledge Translation works regularly with the Manitoba Centre for Health Policy to develop infographics that summarize the key findings of their thorough, data-rich reports. The graphics are used as a backdrop for news conferences, featured in online articles, leveraged by MCHP to promote their reports through social media, and housed on MCHP’s website and outside their offices. Visit Manitoba Centre for Health Policy to read the full report and learn more.